NEW YORK, NY – JANUARY 12, 2017 – Demented Punk today released DR. DEMENTO COVERED IN PUNK, aspecial two-hour demented punk extravaganza featuring an eclectic mix of artists from the world of classic and contemporary punk/indie/alt-rock, along with special guest stars from film, TV and more. This audio oddity is a modern-day homage to radio icon Dr. Demento, a world-renowned institution who has championed novelty music and its creators since the 1970s, will be released on January 12, 2018 by both physical and digital retailers. Fans can order the physical album HERE or the digital version at iTunes now. 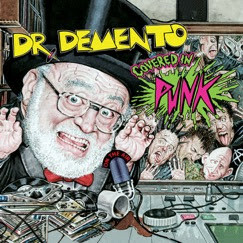 Dr. Demento Covered In Punk features over thirty different, never before released, all-new ‘punk’ cover versions of ‘mad music and crazy comedy’ songs famously heard on the airwaves of the legendary “Dr Demento Show”- intermixed with ‘wild card’ tracks showcasing some incredible, newly ‘demented’ versions of punk-rock classics! Joined by everyone from the Misfits, Joan Jett, Fred Schneider of the B52s, to “Weird Al” Yankovic, the late Adam “Batman” West (in one of his final performances), and Captain Kirk himself, William Shatner-(to name just a few). The Doctor is in…and he’s ‘Covered in Punk’!! A full track listing can be found below. Dr. Demento Covered In Punk includes an in-depth booklet with equally entertaining liner notes and personal quotes from the participating artists, a foreword by album producer and Demented Punk founder John Cafiero (Misfits, Ramones, Osaka Popstar), an afterword by Dr. Demento, as well as factoids, photos and an array of dynamic paintings and illustrations created exclusively for the project by a team of visual artists spanning the world of comic books, classic punk rock album covers, Topps trading card series, Mad Magazine and more. The cover artwork for the album was created by iconic illustrator Drew Friedman whose work has appeared in countless publications from Entertainment Weekly and Time Magazine to Rolling Stone and the New Republic and just about everything in between. 1. A 3LP colored vinyl triple-gatefold package with 20-page booklet. 3. A limited edition 3LP triple gatefold package with variant vinyl splatter and 20-page booklet. 4. A Digital Download with 42-Page digital booklet. Wind up your radio dementites and dementoids-the doctor is in! The Dr. Demento Show has been celebrating ‘mad music and crazy comedy’ on the airwaves playing everything from Spike Jones to Frank Zappa for nearly five decades. Responsible for introducing the world to its #1 most requested song of all time, “Fish Heads”, and launching the career of the most successful artist in the entire history of funny music-“Weird Al” Yankovic; the world-famous Doctor’s influence on pop culture has earned him induction into the National Radio Hall of Fame, a documentary feature film on his life and career currently in production, and even an appearance on The Simpsons.